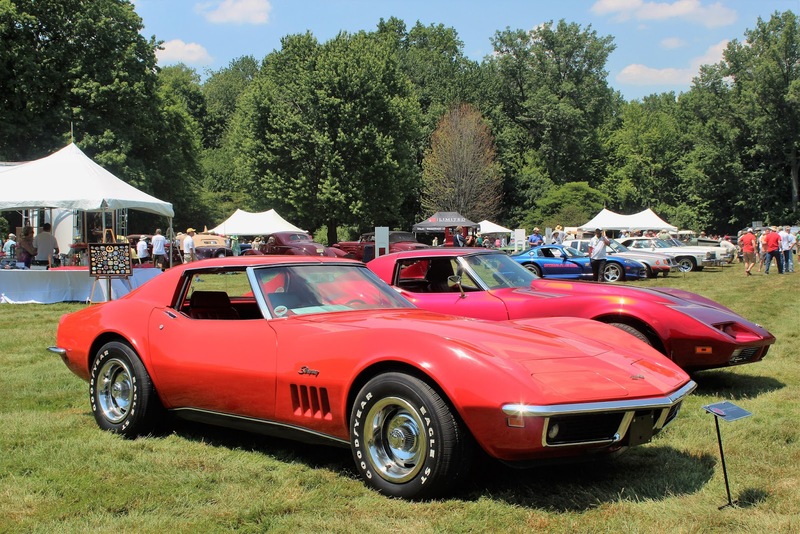 Travels with our 2008 Chevrolet Corvette to interesting places, automotive-related and otherwise, and to meet the people and cars that make up the Corvette Community. 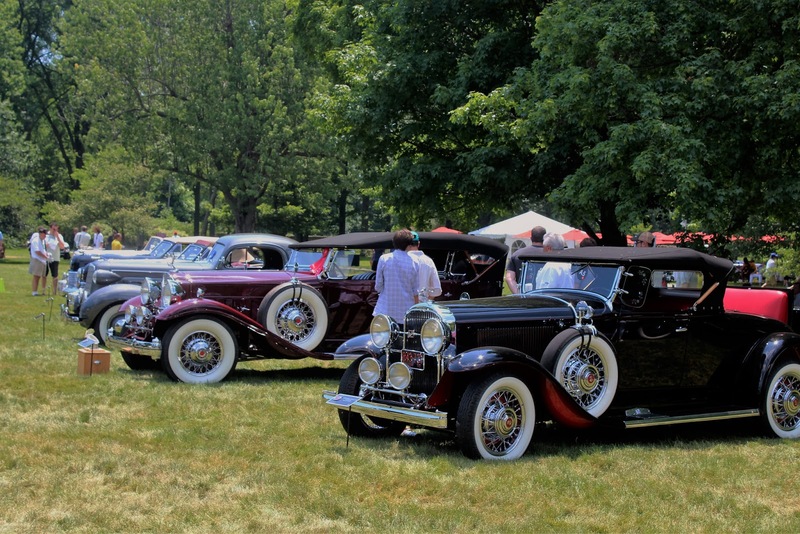 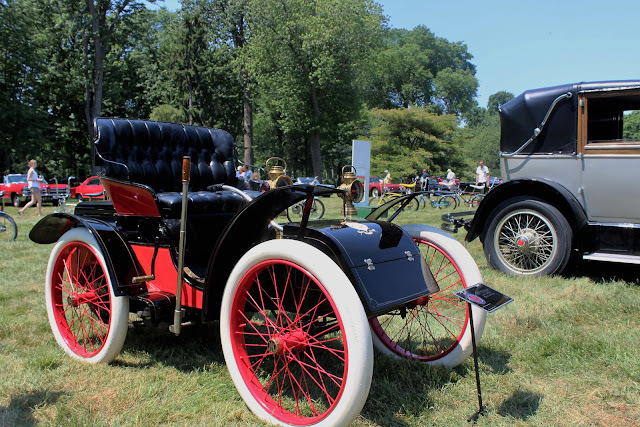 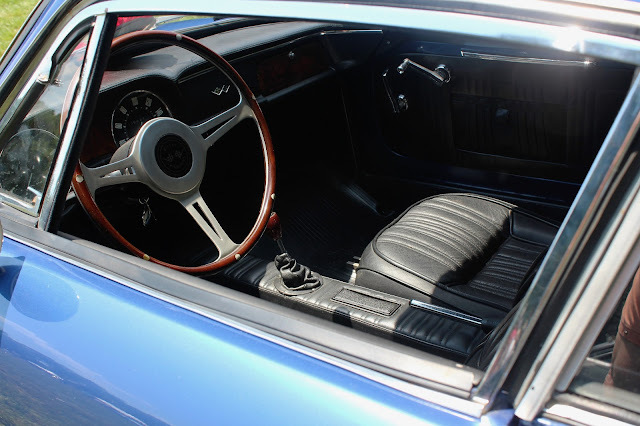 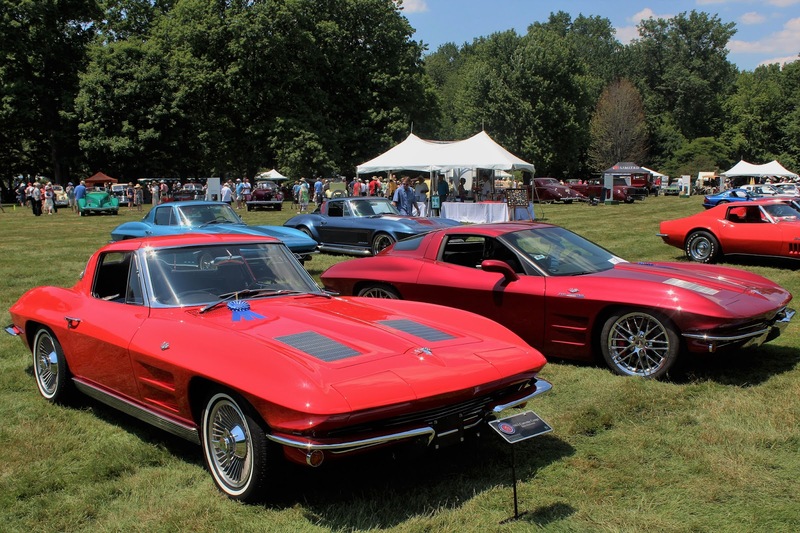 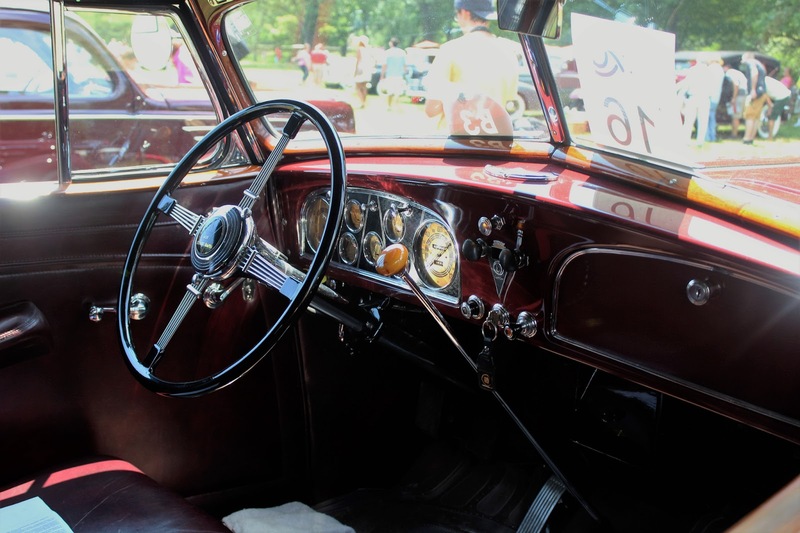 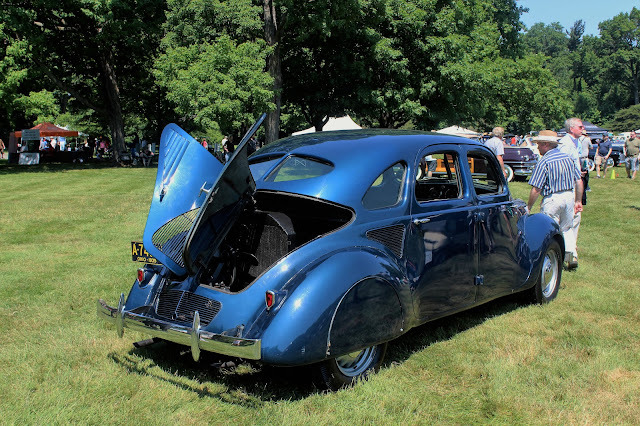 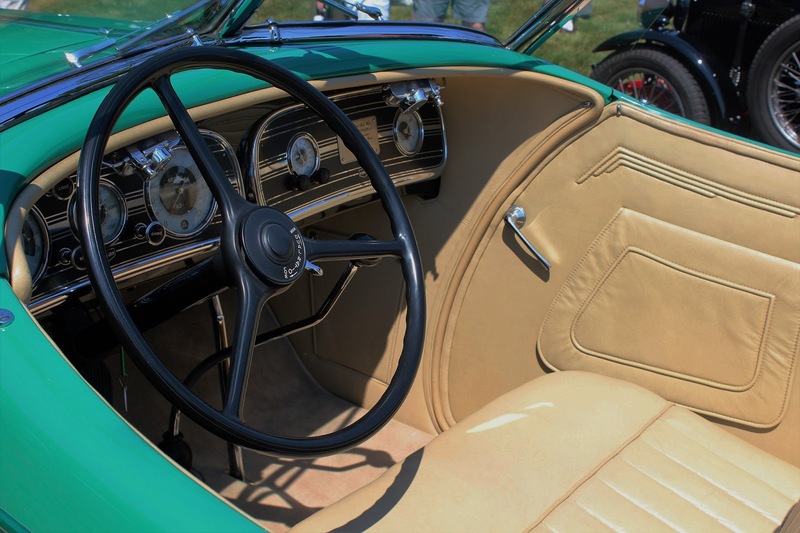 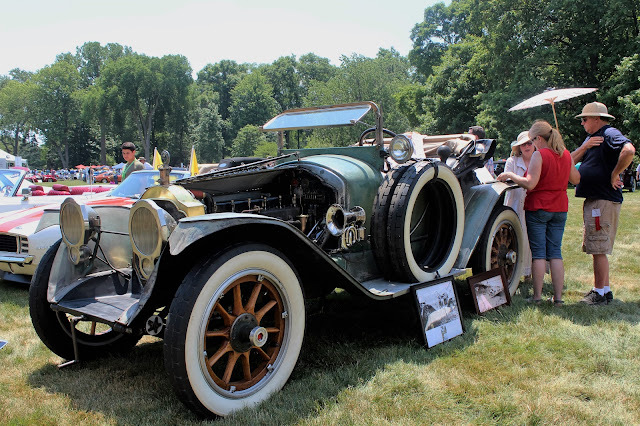 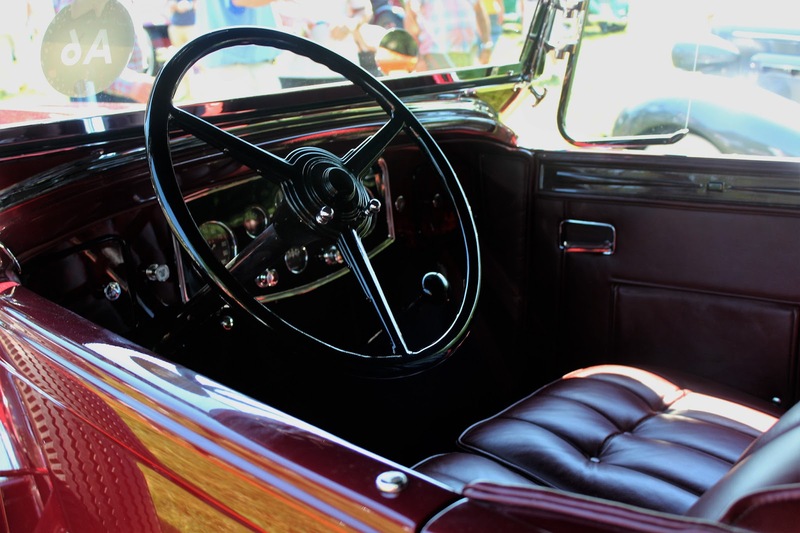 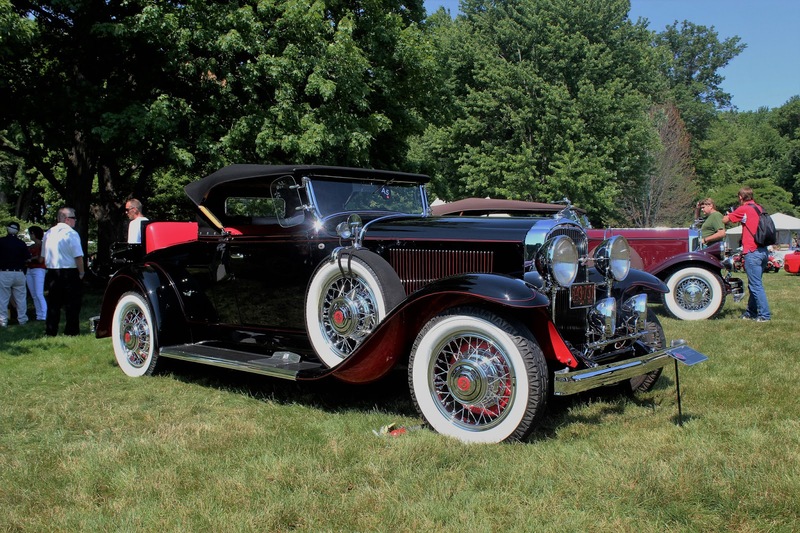 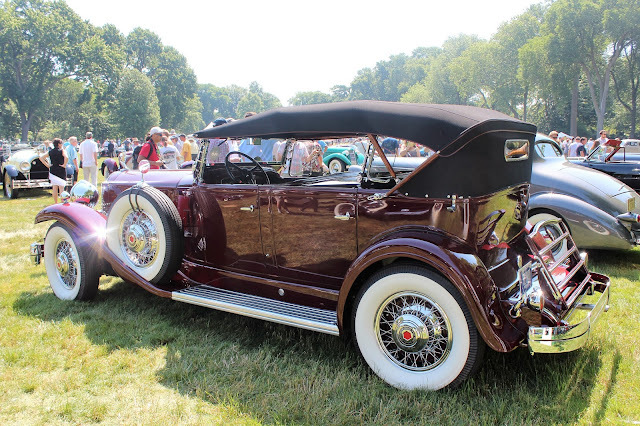 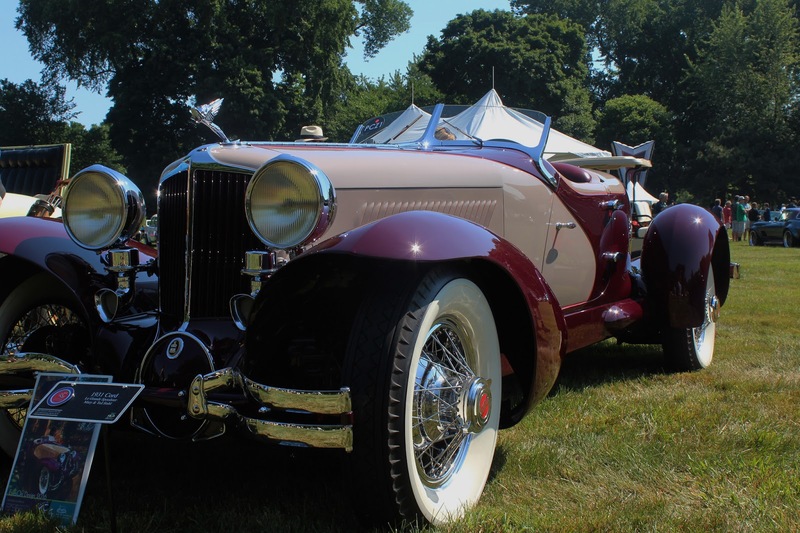 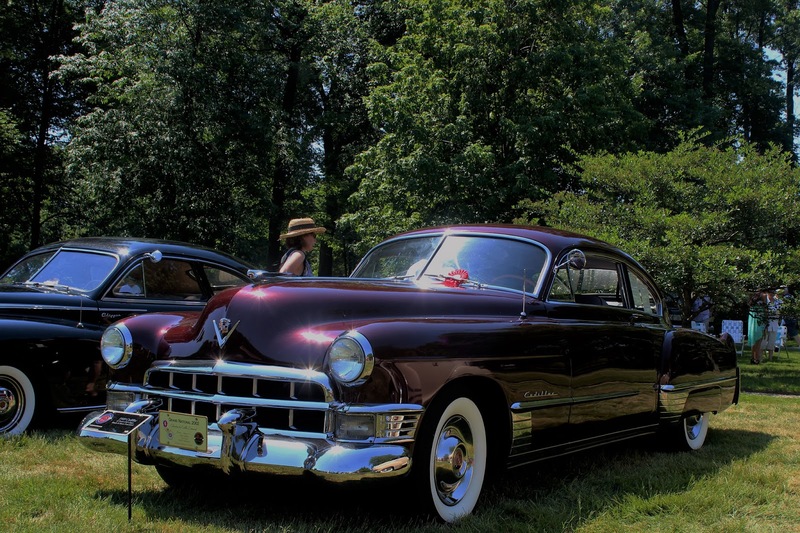 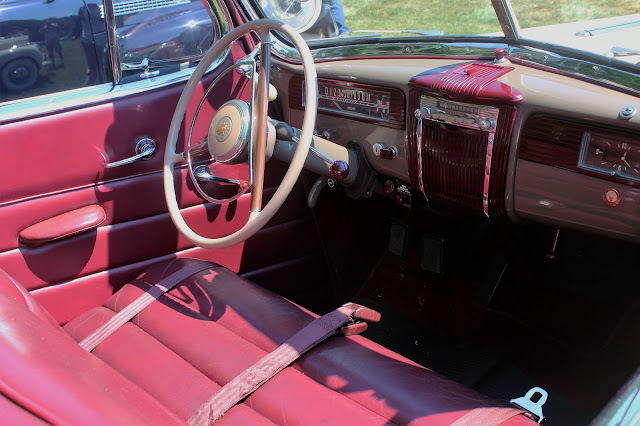 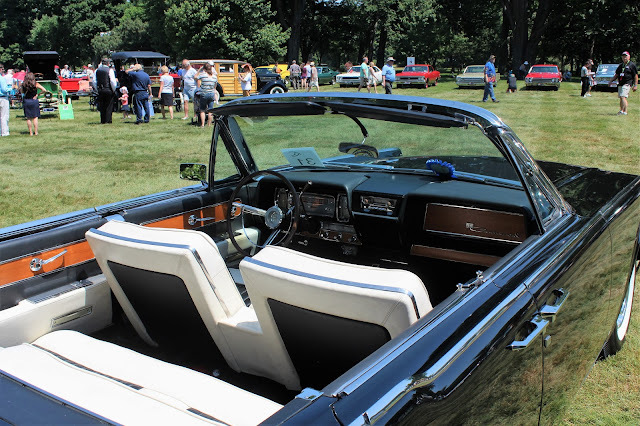 One of our premier reasons for coming to the Detroit area was to attend Eyes on Design, an annual auto show held on the grounds of the Edsel & Eleanor Ford House in tony Grosse Pointe Shores, Michigan, each Father's Day. 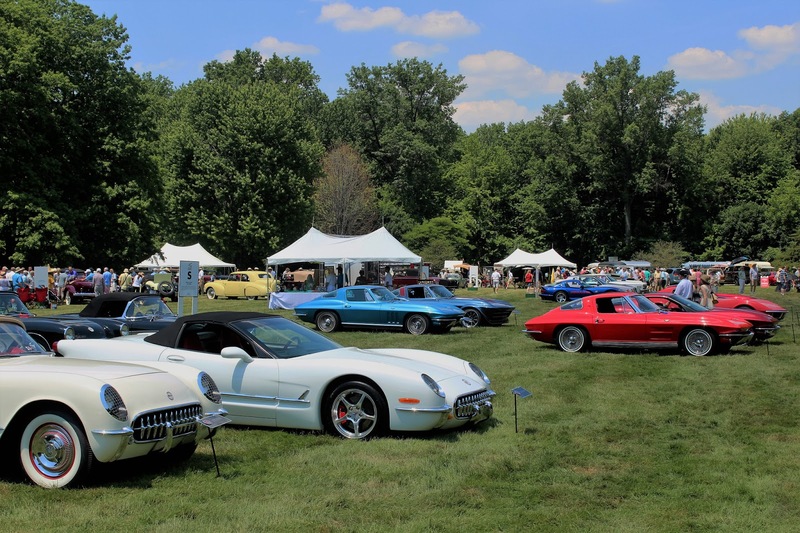 This event, and the 2016 edition was the 29th one, is focused on significant automotive design and raises money for various charities dealing with vision health and support for the visually impaired. 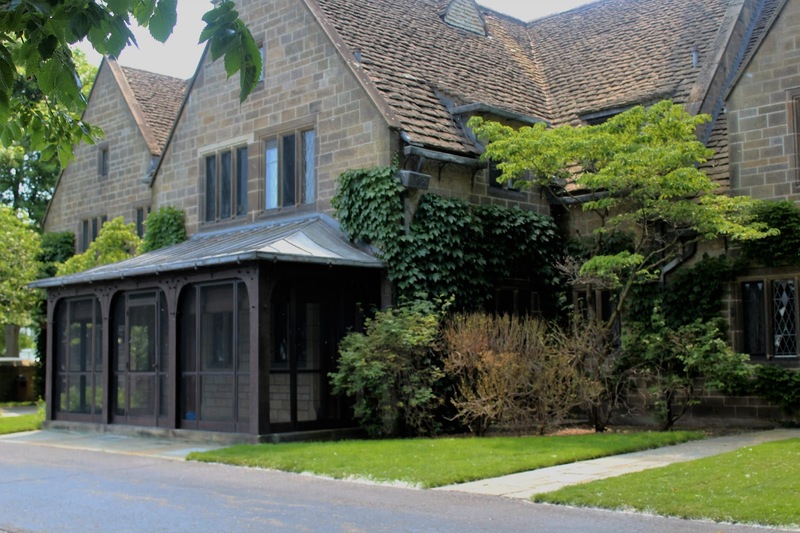 It has raised more than US$ 4 million to this end. An intelligent and well-educated man, Edsel Ford (1893-1943) was the only acknowledged son of industrial titan Henry Ford, and was president of the Ford Motor Company from 1919 until his early death. Under enormous pressure from his domineering father, Edsel Ford was nonetheless a competent and skilled manager with an excellent aesthetic sense and it is most fitting that an auto show focused on design is held on the grounds of his home. More than 300 cars were on display on the scorching hot Father's Day we attended Eyes on Design and under the general theme "Driven by Design" the organizers had divided up the entrants into no less than 25 different categories. 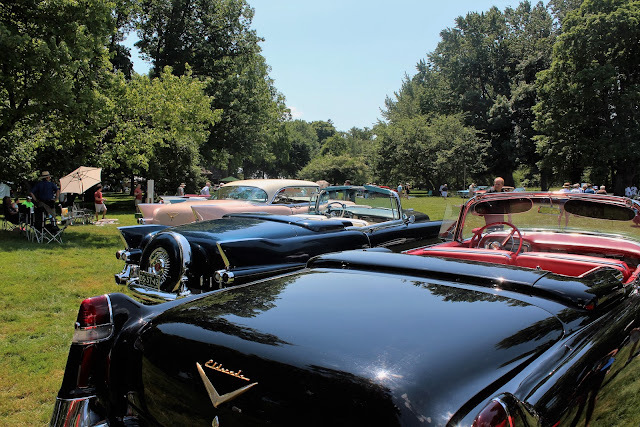 After parking in the spacious field across from the gatehouse, we entered Car Heaven as first up was a series of super classic cars from what we consider motoring's most glamourous era. 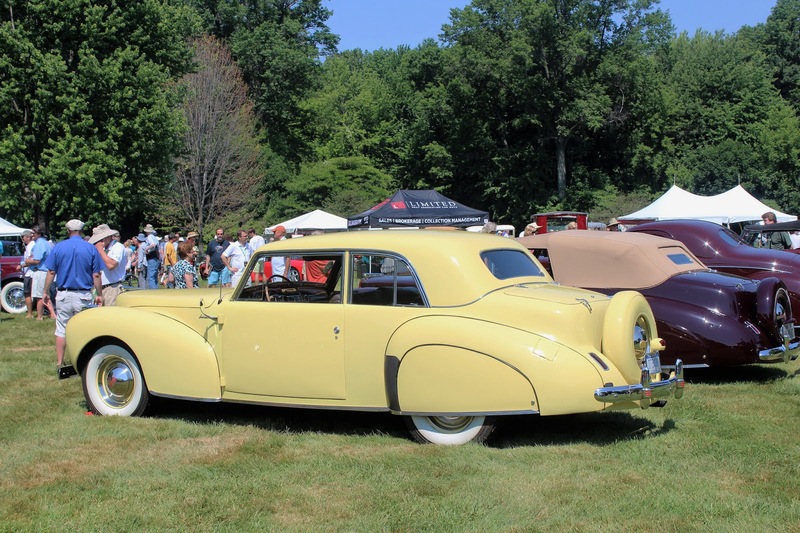 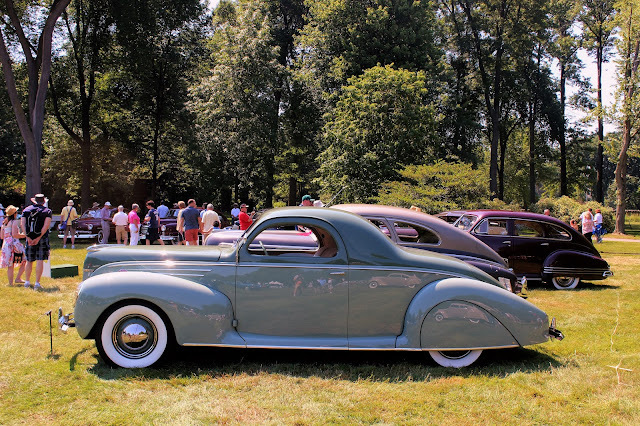 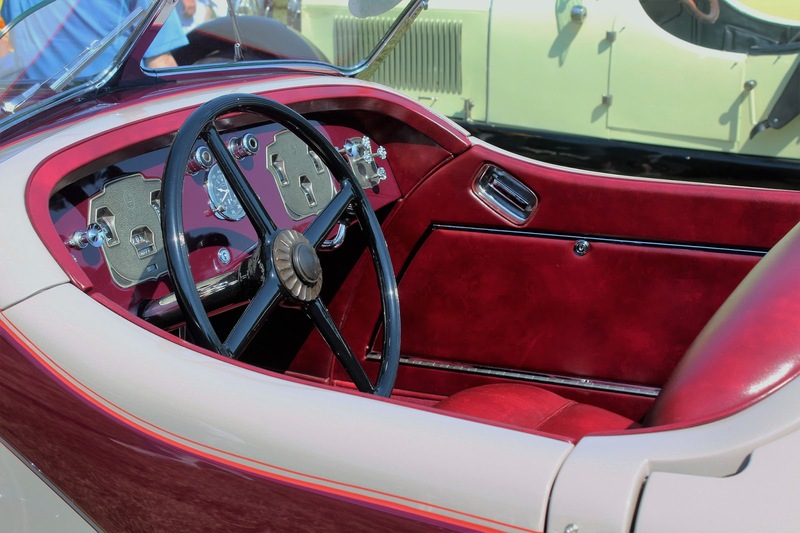 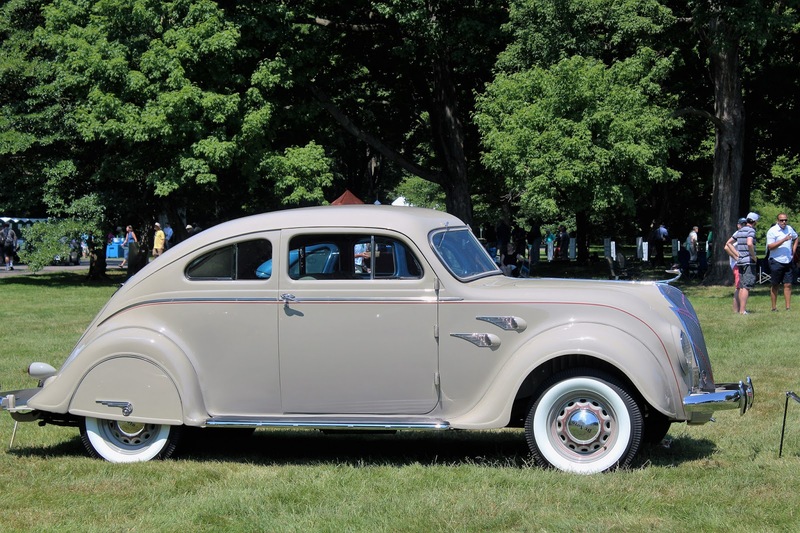 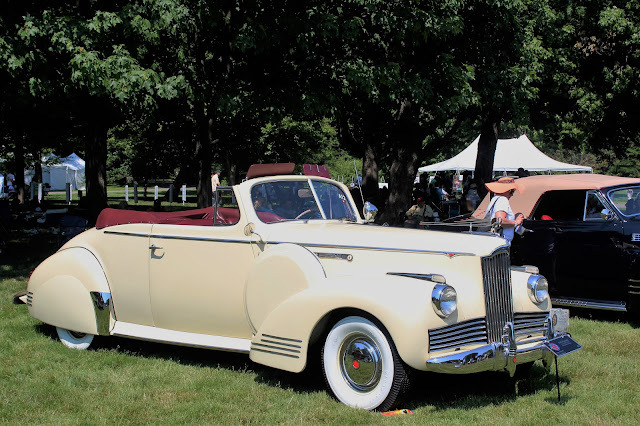 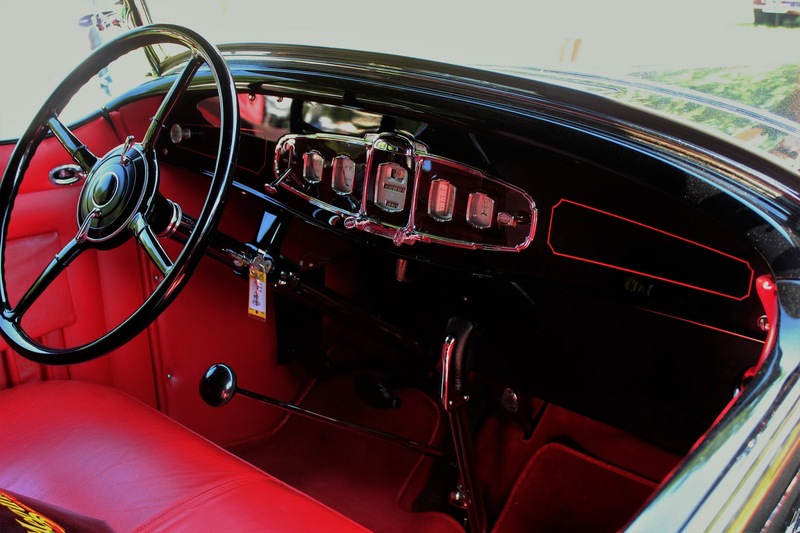 After enjoying these monumental cars, we found ourselves in the next section featuring various Speedsters and American Classics, notably Lincoln Zephyrs, Cords and Auburns. 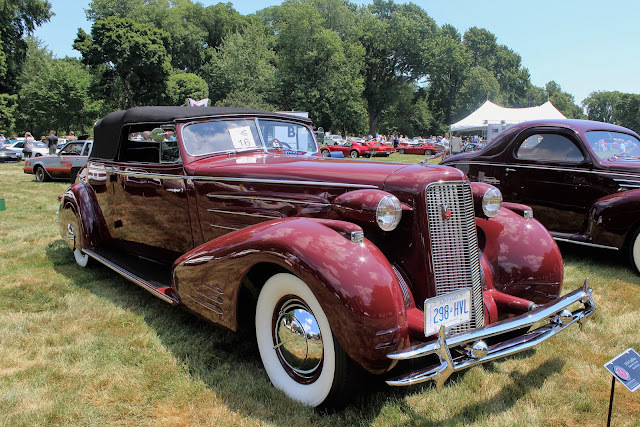 The standout for us had to have been the event's "Poster Vehicle," a recreation of the 1931 Cord Le Grand. 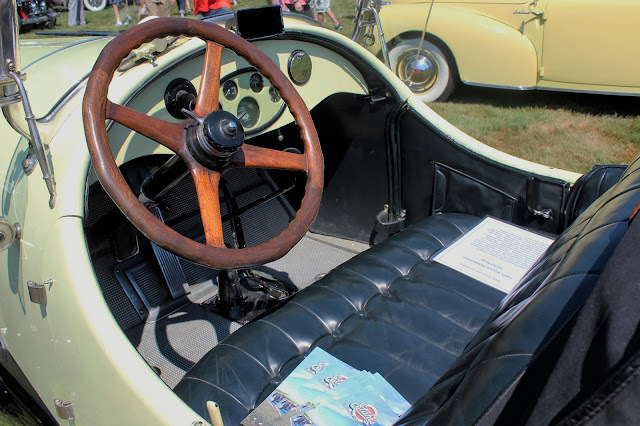 This small car was stunningly beautiful, based on the Cord L29 design elements, and only one was ever built. Today there are not one but two exact replicas in existence. This one came from the Stahl Museum in Michigan and features a humidor for cigars in the driver's door and a decanter and glasses in the passenger's one. 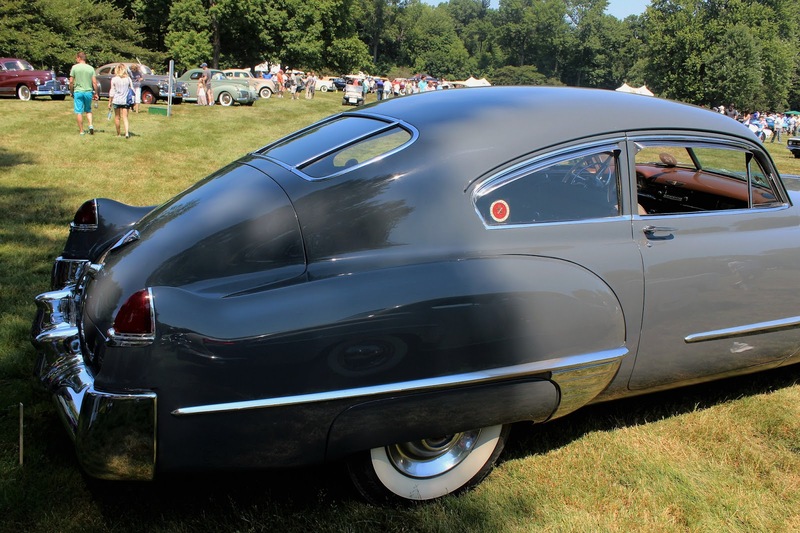 A large section of the field was devoted to Streamliners, and the Art Deco design influence pre-World War II. 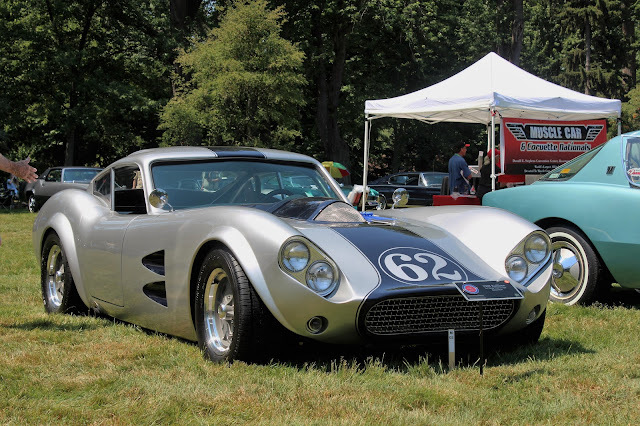 There was a fascinating area devoted to cars from Kalamazoo, Michigan, with several really obscure brands and the one famous one: Checker. More modern luxury cars were nicely represented with a pair of 1949 Cadillacs, a brand that a year previously had introduced the Era of Fins. 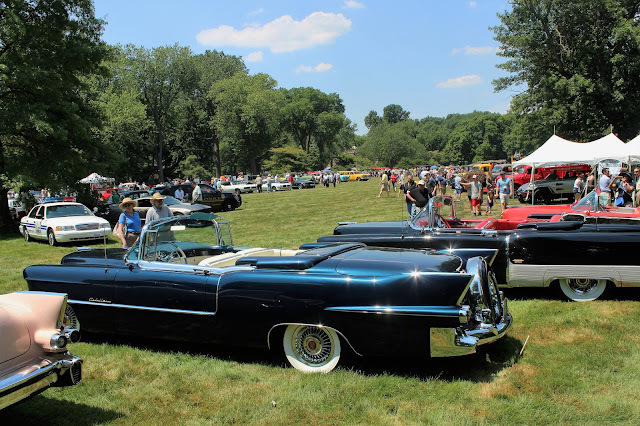 On the other side of the field near the house was "Gold Standard of the World: Cadillac Eldorado 1953-1966" highlighting 14 of these monsters. 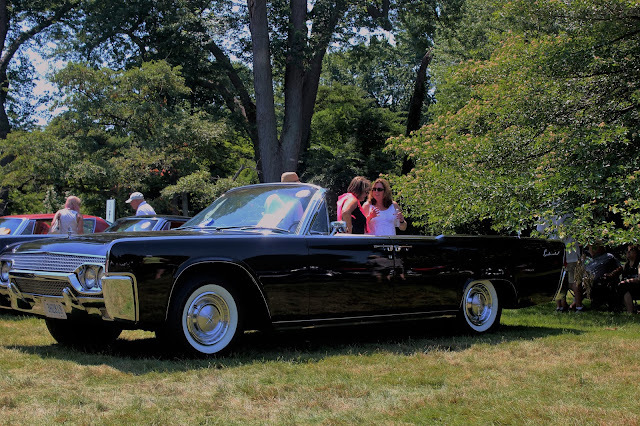 Of course, my personal favourite luxury car of the 1960s had to be present in the form of a 1961 Lincoln Continental Convertible. 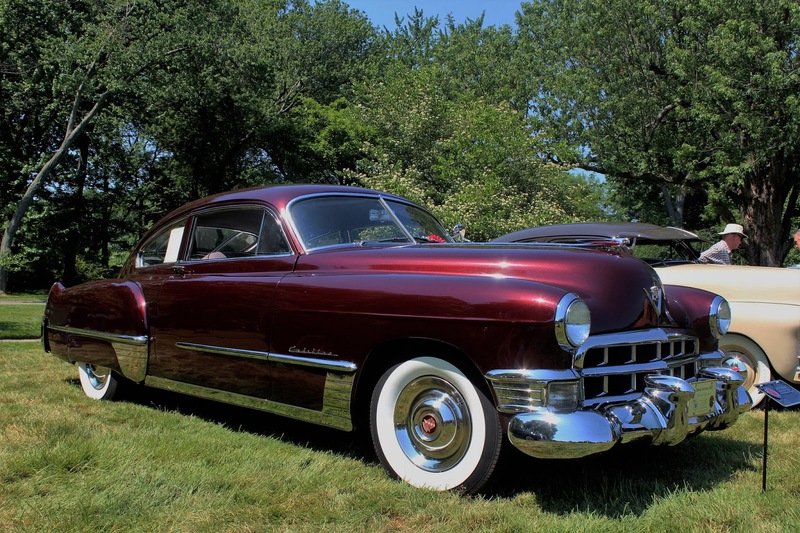 This was the anti-Cadillac, a sober and elegant design that tossed out much of the design language of the 1950s forever. 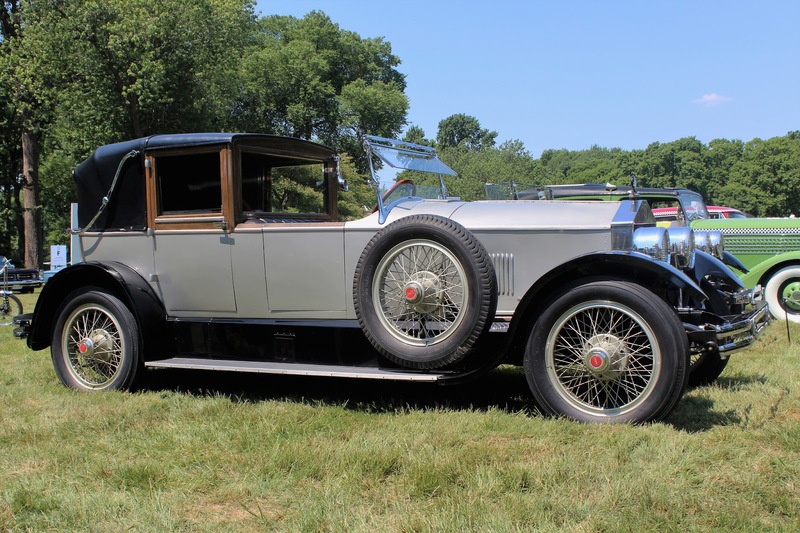 Edsel Ford had persuaded his father to buy the bankrupt Lincoln Motor Company in 1922 and made the previously unstylish but finely-built cars into a match for the top luxury brands in the world. 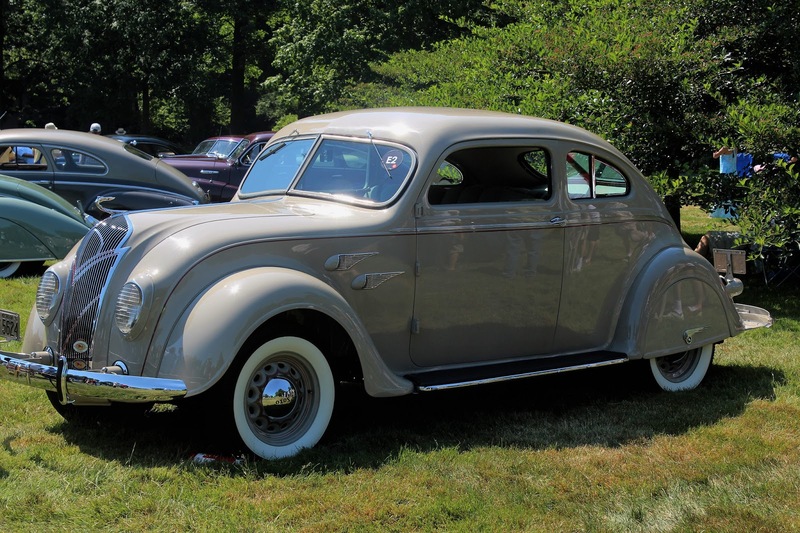 There was a selection of vintage police cars, another for Pontiac performance vehicles, and still another for the Chrysler 300 Letter Series 1955-1965. 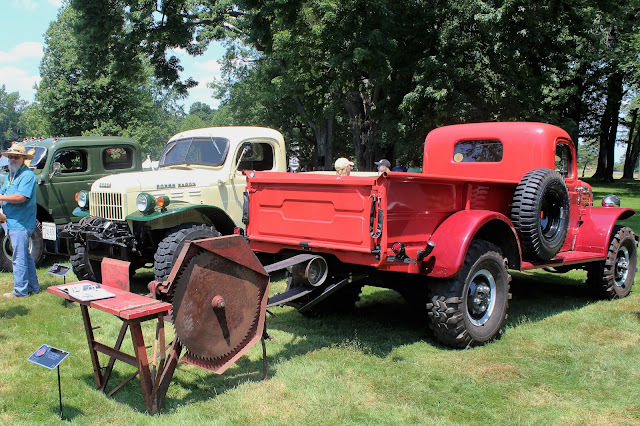 There were familiar muscle cars from the 1960s, a display of "chopper" style bicycles and an illuminating cross-section of vintage camping rigs and trailers going back to Model T days. 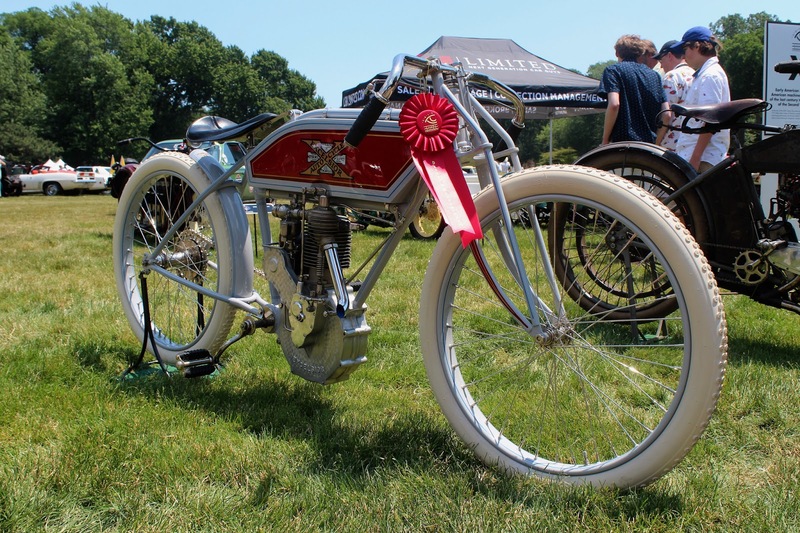 There was an amazing collection of colourful vintage motorcycles, which all seemed to be owned by the same collector. 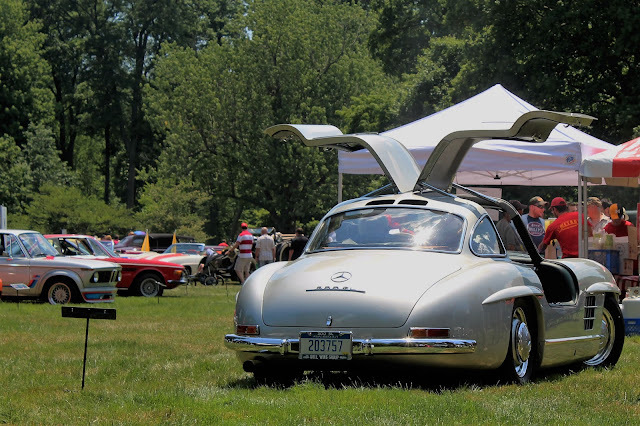 European cars were not forgotten, with an interesting choice of cars ranging from a nice Mercedes-Benz 300SL Gullwing to a rather rare Bitter CD and some Italian supercars. I was particularly intrigued by a car that I thought was a French Alpine A108 sports car, a tiny classic lightweight, but I learned a great deal from its owner, Mr. Brent Bartley, who explained that it was actually a car built in Brazil by Willys-Overland (yes, the Jeep people). 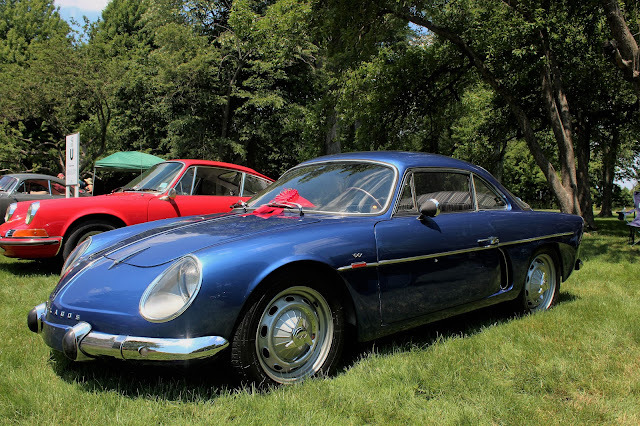 under license from Alpine. The fiberglass-bodied Interlagos Alpine A108 used Renault Dauphine running gear and the tiny 845 cc engine produced a slight 60 hp. Still, a very cool car although I am not sure I would actually fit into it. There were so many interesting cars to look at that it would have needed several days to get good photos and talk to the owners; the Eyes on Design exhibition book is a bit sparse but given the number of cars perhaps not so surprising. Can there be anyone who does not think the Dodge Power Wagon was the coolest truck ever? 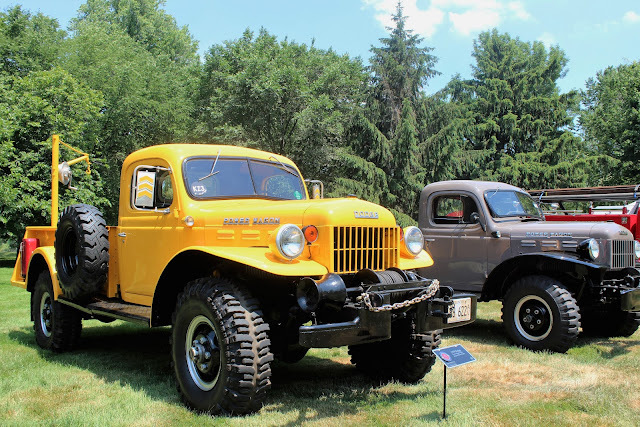 11 of these macho trucks were present; Dodge offered four-wheel drive direct at a time when GM and Ford outsourced their trucks to be modified by third parties. 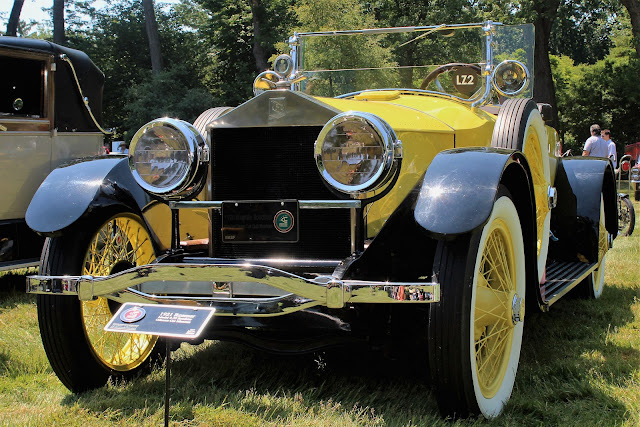 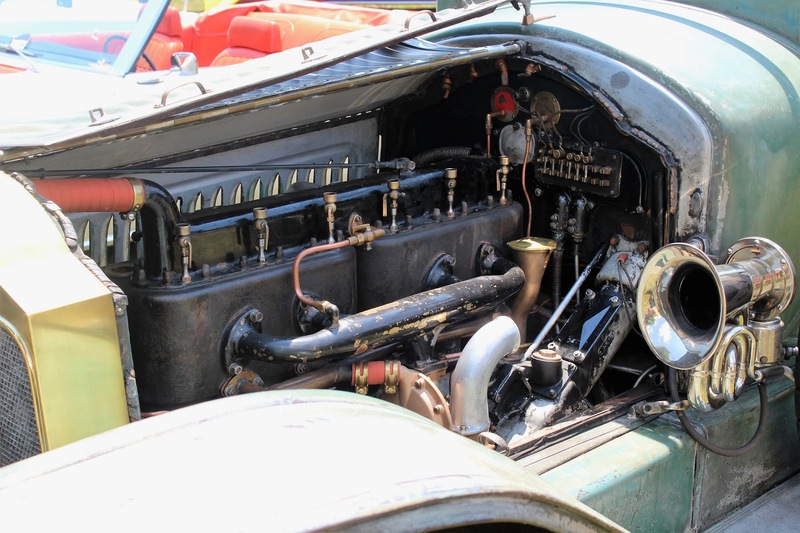 Another wonderful story was that of the 1914 Packard Model 3-38 Speedster that was once owned by Indianapolis Speedway founder (and Miami Beach real estate tycoon) Carl Fisher. 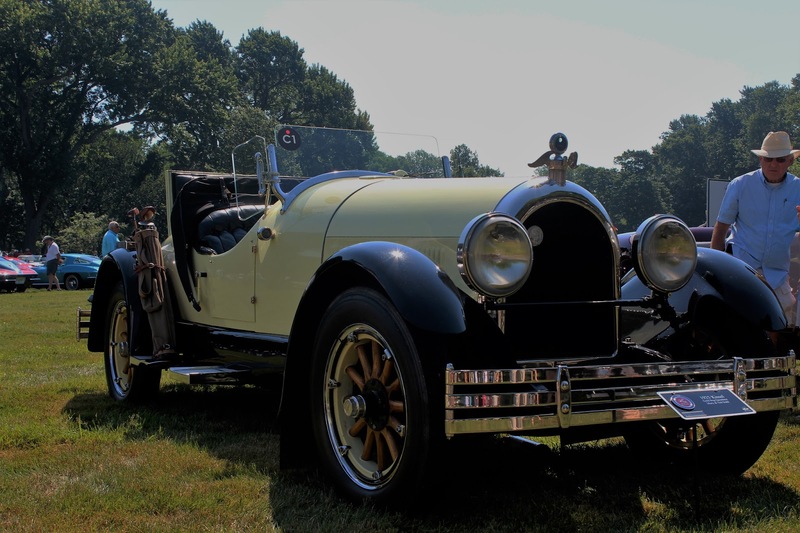 This car was driven by Fisher as he surveyed what became the first coast-to-coast highway in the United States, the Lincoln Highway. It was used as the Pace Car for the Indianapolis 500 in 1915 and 1916. 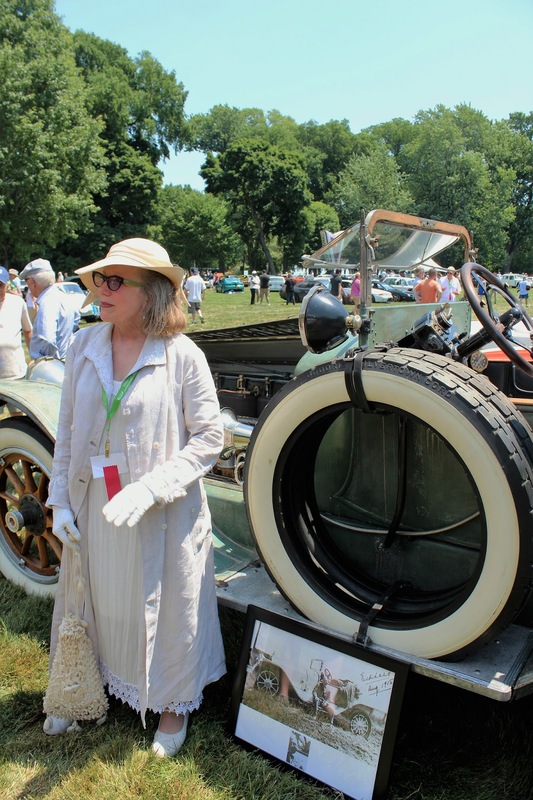 A very enthusiastic lady, Mrs. Nancy Strong, owns it with her husband Allen and was present in period costume to tell us all about the car and its history, with period photos. Not driven for perhaps 80 years, it returned to the Indy track in May 2016. On the way into the show, I ran into Ken Lingenfelter, who was acting as one of the judges. 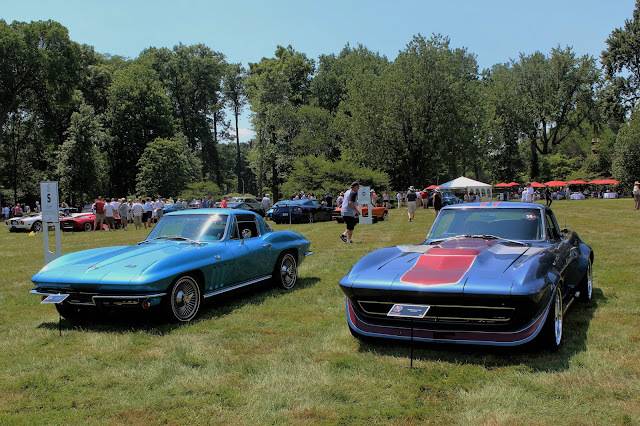 Of course, one of the categories had to be "Stock to Rock: Corvettes" and things were arranged so that a stock version would be displayed next to a modified one of the same vintage. Corvettes are always great to see but we were particularly taken with a 1969 Coupe that had the most incredible red paint job, with flames painted on so subtly you could barely see them. 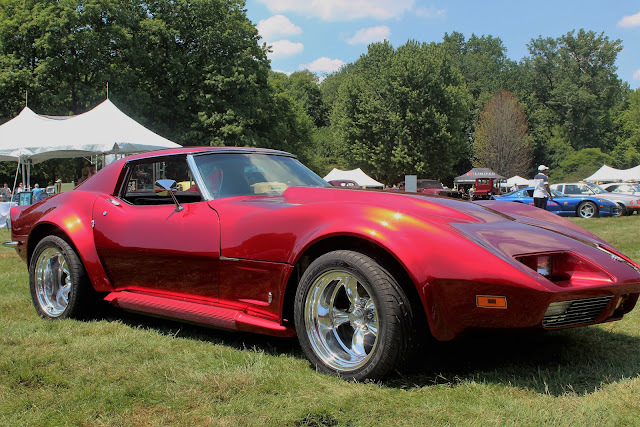 Mr. Lingenfelter brought one of his C1 factory prototypes. Corvettes are infinitely adaptable to one's taste, it seems, and although they are not all what I would choose I applaud the originality and personalization. 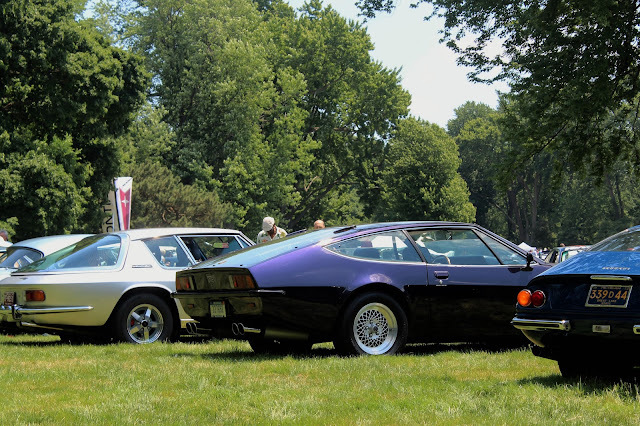 That said, I do not like the rebodied cars that make a C6 look like a C1 or C3 since the proportions are generally all wrong, whereas taking a clapped-out C3 and resto-modding it with a modern chassis, engine and creature comforts works fine for me. A truly great show in an excellent setting, Eyes on Design is the show where you need every minute to capture everything, so diverse is the offering. 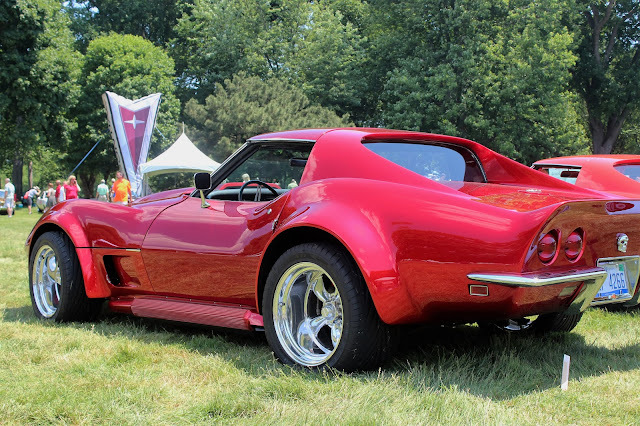 We crossed the street and were grateful for our Corvette's powerful air conditioning. 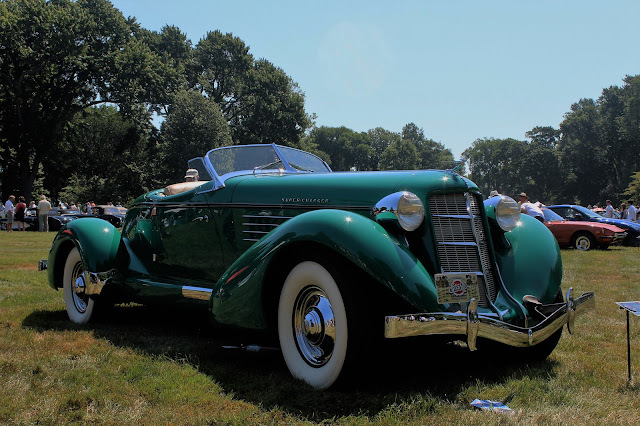 It was time to head south to Cincinnati and the Art Deco Hilton Netherland Plaza, the next stop in our motoring tour.